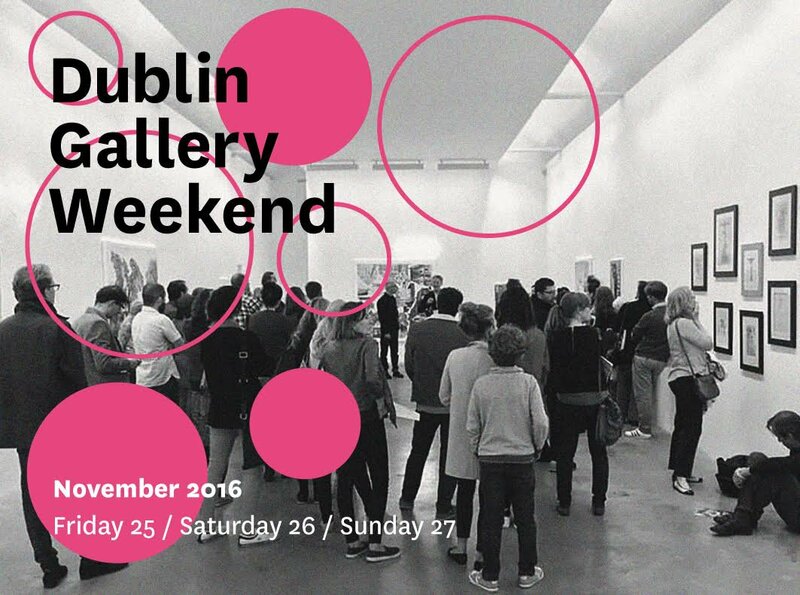 Dublin Gallery Weekend is set to return even bigger in 2016 with more galleries taking part. The visual arts festival will be taking place in Dublin from Friday 25 to Sunday 27 November 2016. Over one weekend, 36 art galleries across the city will throw open their doors and invite visitors old and new to experience the exciting and inspiring art on offer in Dublin art galleries. A series of special events, including exhibition openings, artist and curator talks, walking tours, late openings and workshops will take place over the weekend. On Friday the 25th there will be a Dublin Gallery Weekend + IMMA afterparty in Odessa Club from 9pm to late, with free entry. It was a great event last year and a packed out night. We would love if you could attend. Other social events during the weekend include causal drinks in the atrium of TBG+S on the Saturday evening from 6 – 8pm, and on Sunday a coffee social in Kerlin Gallery at 12pm. Following a successful year, HALFTONE Print Fair returns to The Library Project, to showcase the best recent work from artists working in printed matter. HALFTONE looks at how different printing processes coexist in a diverse range of artistic and creative practices, celebrating the printed matter in all its forms. Get to know the different printing techniques, learn new skills, and discover new work. In addition, all artworks will be available to purchase, making it available to a wider audience and supporting the artists. Don’t miss this 4-days-long celebration of the printed matter: come and enjoy the workshops and browse a large selection of contemporary artist’s prints on sale, from lithographs to risographs, from photographs to etchings, from watercolour to graphic design, and much more! Learn a new skill, perfect a current one and just have fun with the workshops taking place during HALFTONE. An introduction to screen printing techniques, participants will be shown how an image is prepared for screen print, exposed onto the screen and printed. Each participant will get to pull their own print by the end of the session. Max 5 participants. Participants who are also attending Read That Image: Stitching Sessions, will screenprint sheets which will be used as their book covers. Black Church Print Studios will provide a pop-up screen printing station in The Library Project. Print your own tote bag or poster. In collaboration with HALFTONE Print Fair and Black Church Print Studio, Read That Image is pleased to announce the return of Stitching Sessions! During this workshop participants will be introduced to the craft of bookbinding and learn about the different papers, materials and tools needed to create their own hand-bound books. Members of the RTI team will guide participants step-by-step through two bookbinding methods: the Singer-stitch and Japanese stab-bind. Making use of these techniques, participants will create their own hand-stitched notebooks. Stitching Sessions participants are highly encouraged to take part in the Black Church Print Studio screen-printing workshop taking place on Friday 25th November as part of HALFTONE. In this workshop participants will have the opportunity to create their own screen-printed book covers. For participants who do not attend the BCPS workshop we will provide coloured card stock for book covers. All binding materials provided. If attending the BCPS screen-printing workshop bring along screen-printed book cover sheets.